If you’re like most New Yorkers, you probably spend a good deal of time on your feet. Whether it’s running errands around town, going for a jog in the park, or even waiting for the next subway, your feet take quite a pounding. Due to the numerous nerve endings at the soles of the feet, accumulated tension and stress in this area can have adverse effects throughout the whole body. Conversely, by working on the feet you are affecting the body’s autonomic nervous system, which in turn helps to relax the entire body. The feet can be viewed as maps of the body. All the major organs, systems, and anatomical areas have corresponding reflex zones on the feet. A typical session will often address specific areas of tension held within the body as well as a broader application through the use of zone therapy. 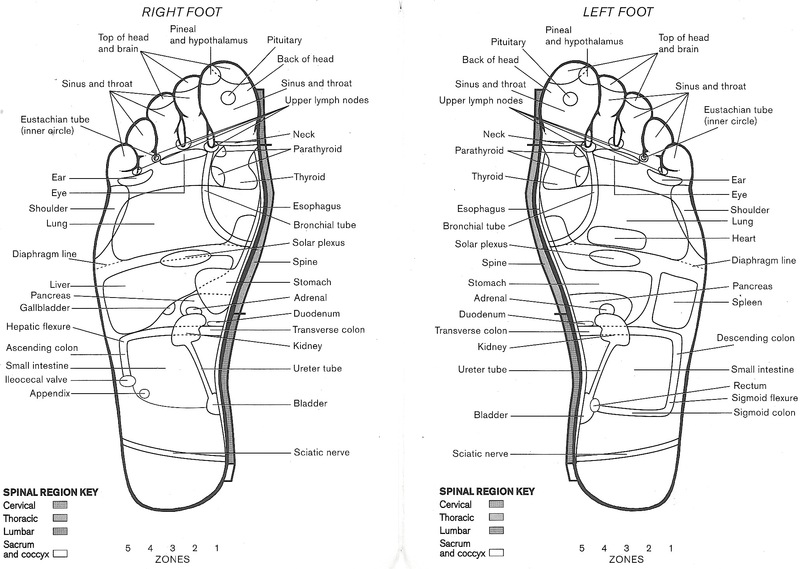 In zone therapy the foot is subdivided into five reflex “zones” or strips which run symmetrically from the base of the heel to the top of each toe. By working each zone you are affecting that entire side of the body. Reflexology is based on the idea that the body has a natural flow of energy. Any blockages in this flow will eventually create an imbalance by promoting stagnation within that part of the body. Reflexology helps to restore this natural flow through an organized and systematic application of pressure to reflex points within the feet, hands, and ears. Reflexology is an excellent way to reduce stress and anxiety. It helps to improve circulation, increase range of motion, strengthen the immune system, and aid in such chronic issues as insomnia, digestive issues, high blood pressure, and depression.